WoSign PKI cloud service officially goes online-WoSign SSL Certificates! WoSign has started to use top root certificates of which independent intellectual property rights and ownership are fully possessed and the new certificate issuing system on May 16, 2011. To meet the growing needs of certificate deployment for customers, WoSign announced to introduce PKI cloud service – system for self-service certificate application and life cycle management of certificate today and welcome all customers to register and use our system. Users can register in the digital certificate store on the website of WoSign and log in the system for self-service certificate application and life cycle management of certificate. This system is a one-stop certificate application and life cycle management system where user can apply for all kinds of WoSign certificate products, including SSL certificate, code signing certificate and client certificate. 1) User can get a free email encryption certificate with one-year validation period after registration and audit. 2) User can have free application for DV SSL certificate with validity period of one or two year priced at ￥488/888 without limitation of quantity within a definite time after successful registration. 3) User can apply for free trial of SSL certificate which is valid for 30 days. 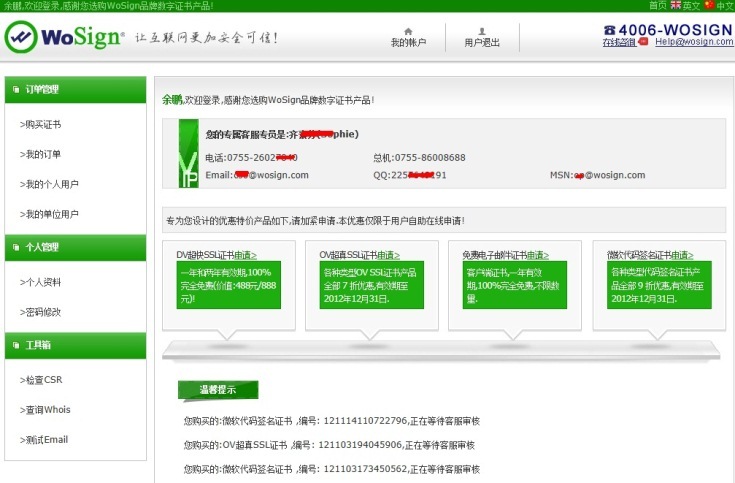 4) User can buy OV ZhenSSL certificate online, enjoying 30%-off discount. 5) User can enjoy 10%-off discount buying all kinds of code signing certificates. For your attention: the above three special offers of 2, 3, 4 are confined only to users who self-helped to apply for certificates online. Users who ask customer service to apply for certificate will not enjoy the special offers. After registration and audit, user will get a free client certificate with one-year validity used in the strong identity authentication when log in “my account” as well as email signature and encryption. User can apply certificate products for individuals, company and clients after logging in the digital certificate store, including one-year-free email certificate and other charged certificates. As long as there is enough balance in the account, user can apply for different kinds of certificate whenever he wants. 1) Low-end SSL certificate which only verifies the ownership of domain is completely FREE! Users can choose either one-year or two-year free SSL certificate, which is global-exclusive. 2) For professional-level certificate which presents name of the organization, user will not have to submit any documentary evidence in one year after real identity of the applied organization is verified. 3) Maximum degree of fault tolerance has been done to SSL certificate signing request (CSR). User CSR can be filled in with anything as long as it is generated by the private key matched with the server. 4) Owner of digital certificate store can apply certificates for his organization or other clients. This will not only be convenient for customers but also can add new profit growing point. Let’s dig out the only gold mine left in the Internet industry together!